Spencer, A.n.. "Jellyfish". The Canadian Encyclopedia, 25 March 2015, Historica Canada. 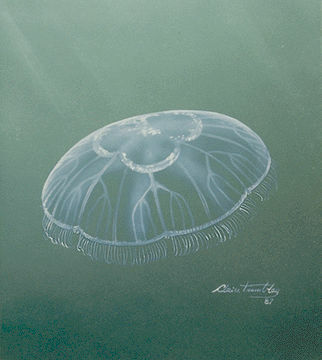 https://www.thecanadianencyclopedia.ca/en/article/jellyfish. Accessed 24 April 2019. Jellyfish, common name for free-swimming medusae of invertebrates of phylum Cnidaria. Jellyfish, common name for free-swimming medusae of invertebrates of phylum Cnidaria. Jellyfish are characterized by an umbrella-shaped body containing a jellylike substance (mesoglea), between upper and lower surfaces, which acts as a buoyancy aid. 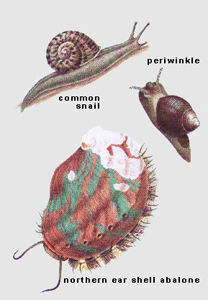 Three types are recognized: true jellyfish (Scyphozoa), hydromedusae (Hydrozoa) and colonial Siphonophora and Chondrophora. 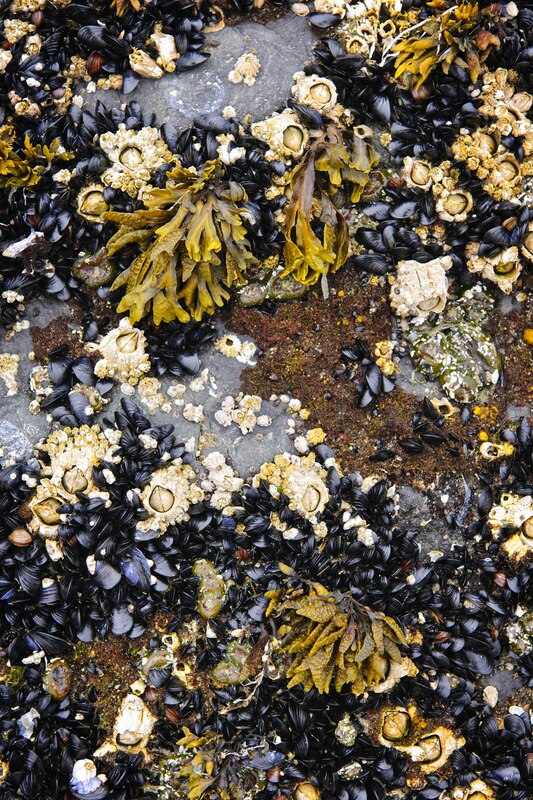 About 110 species are found in Canadian waters. They can occur in incredible densities; eg, moon jellies (Aurelia aurita) may clog boat cooling systems. Their effectiveness in capturing other planktonic animals makes jellyfish an integral part of oceanic food chains. Stinging cells (cnidoblasts) used to capture food have made some species notorious: sea wasp (Chironex fleckeri), off Australia's Queensland coast, can kill unwary bathers; the sting of the Portuguese man-of-war (Physalia physalis), however, is probably never fatal. Most Canadian species are harmless. Jellyfish buoy themselves by mesoglea or by gas-filled bladders. Siphonophores and chondrophores are supported by bladders and may be buoyant enough to float at the surface (eg, Physalia and Velella). Sail-by-the-wind-sailor (Velella) has a sail which usually keeps it away from shore by enabling it to tack across the wind. 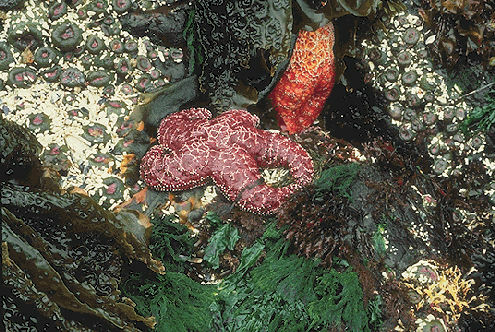 After periods of prevailing onshore winds, these jellyfish may become stranded on the outer BC coast in such numbers that beaches turn violet. 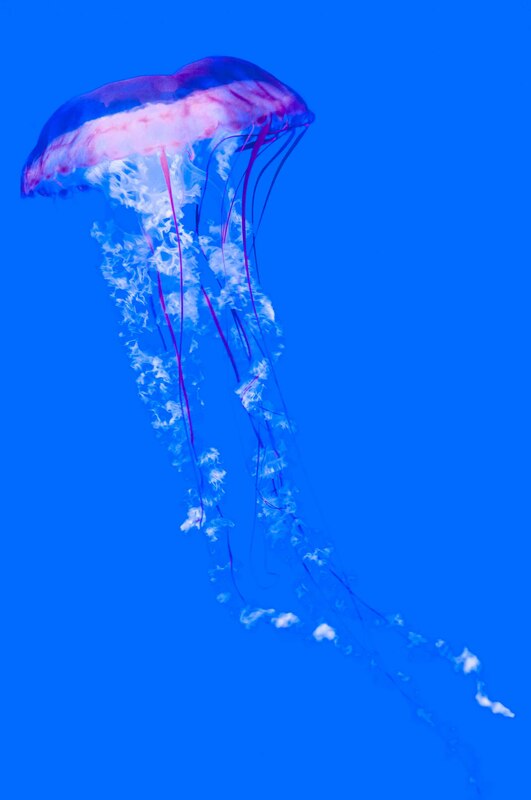 Jellyfish move by jet propulsion, using powerful muscles to squeeze water out of the cavity formed by the umbrella.